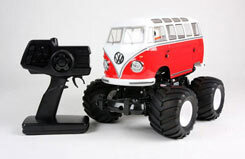 All Products > "57826 Tamiya 1/12 XB VW Van WR02"
Fresh from the factory, the WR-02 chassis features a heavy-duty monocoque frame equipped with 4-wheel double wishbone suspension and a fully enclosed gearbox with differential. Like its older brother, the Wild Willy II (57743) this model is designed for high speed wheelie action, so a wheelie bar included! Sitting atop of this chassis is the new (and designed specifically for this model) VW Camper bodyshell, complete with pre-painted oversize driver figure! Radio System, Battery and Charger included!